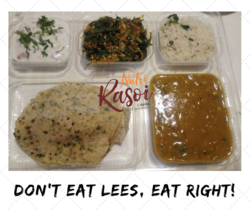 Nutri rasoi - Service Provider of healthy food snacks, nutri balanced meal service & healthy weight loss meal service in Ahmedabad, Gujarat. you can enjoy the convenience of portion-controlled, nutritionally balanced meals, prepared just for you with only the freshest ingredients and your life style goals in mind. This meal is ideal for healthy-weight loss and long-term weight management. Our specially designed, calorie controlled daily meals and snacks are designed to optimize your daily intake of nutrients and help target your goals. The variety, flexibility and support we offer will help you loose weight in sustainable way. So you no longer need to think twice about being healthy and can feel good all the time. Staying fit requires hard work, discipline, consistency and the right nutrition. That's why we've created a special program for more active clients and who wants to gain weight. Healthy weight gain or increasing muscle mass is possible only by fueling up body to maximize the nutritional intake your body needs for peak performance and recovery.